Since 2008, I have helped students prepare for the math portion of the following exams and more. I took the TEAS and you are not going to believe it. I have to bring you this score when I see you. I passed math with 70% (cut of is 60%)—the part I was so worried about!!!! ​I'm ECSTATIC to tell you that I PASSED!!!! It really wasn't as hard as I thought it would be. Thank you for helping me get here. 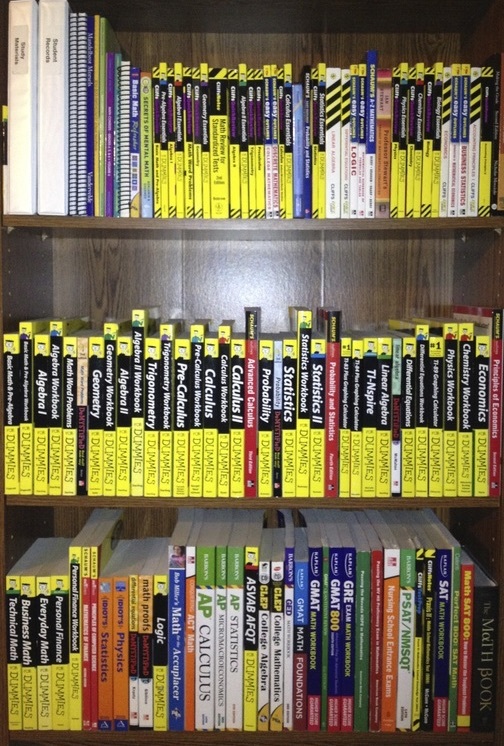 This was my math tutoring library in the early years of my math tutoring practice. It has since been replaced by a similar library of e-books on my tablet computer. Additionally, the electronic upgrade includes textbooks for some of the most common subjects that I tutor students in.